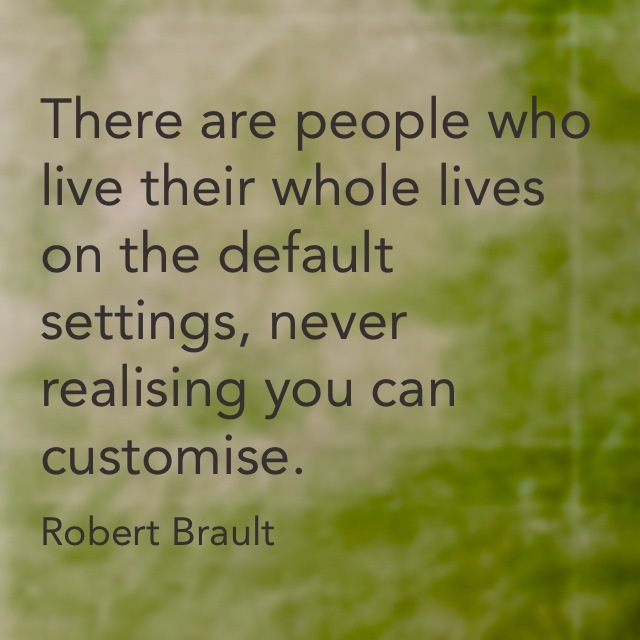 What is your default setting? When everything around you falls apart, what do you instinctively do, where do you retreat to? I am an organiser. I love my lists. I love my plans, and I absolutely could not live without my diary. I love knowing what is going to happen, and when. Now you may think all this planning must mean that I am not following my goal of ‘living lighter‘ for this year. But I do not plan an activity for every moment. Sometimes I ‘plan’ at home days for myself and the girls. However, if those plans (even for an at-home day) get disrupted I say it has been “hijacked”. And doesn’t that tell you an awful lot. The terminology that I choose to indicate that my day hasn’t gone to plan indicates a forced seizure and diversion. I have just found out that Mr will be travelling again, at very short notice, and what do I do? I return to my default setting. I try to organise the heck out of my life. I have been calling family members to organise birthday events a month away. I have a colour coded timetable on my desk covering every event from today until the end of September. I am possessed by needing to know what is going to happen for at least the next five weeks.